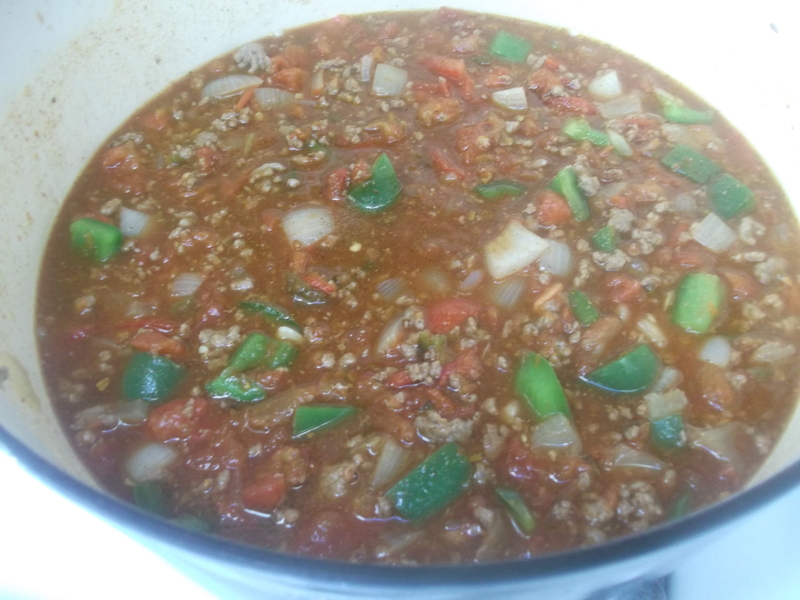 A few years ago I decided to make my first ever batch of chili, which was kind of a big deal for me. I had never really been a huge chili person. I would always eat some if it was around (if my husband made it, or at the chili party our friends host every year), but I never liked it enough to want to make a batch myself. But I thought I should really try, so I gave it some thought, took to the kitchen, and wrote down exactly what I used and what I did. Beginner’s luck worked in my favor, and this recipe was born. I may not be a chili expert, but I still think this is pretty good. 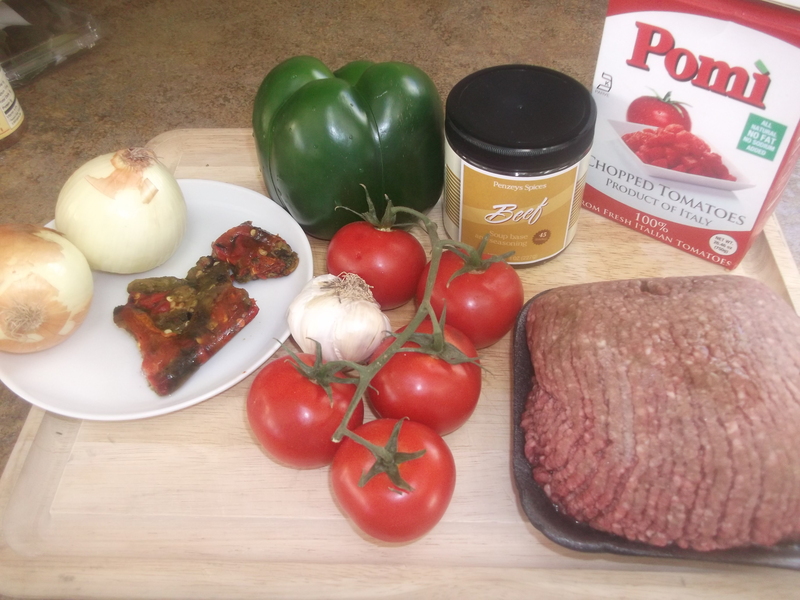 In a large pan or Dutch oven, brown the ground beef. 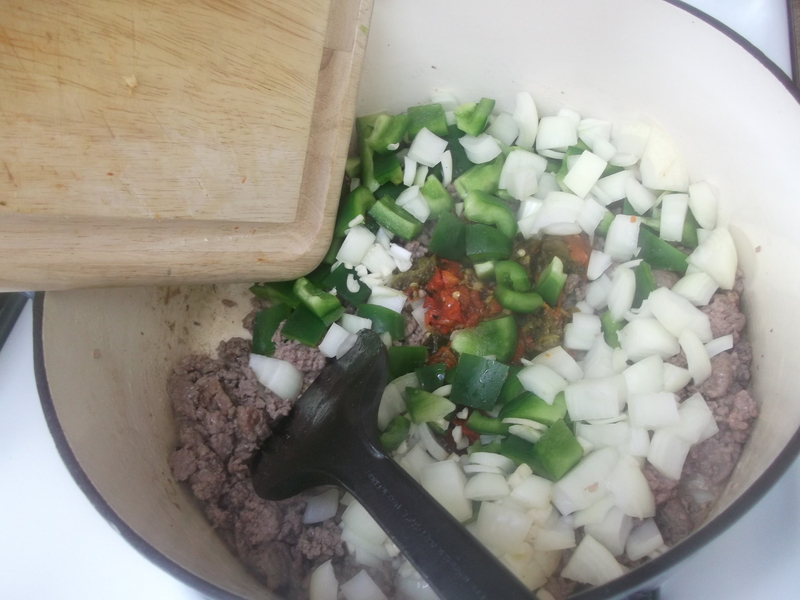 Add the onion, green pepper, green chiles and garlic, and sauté until softened. 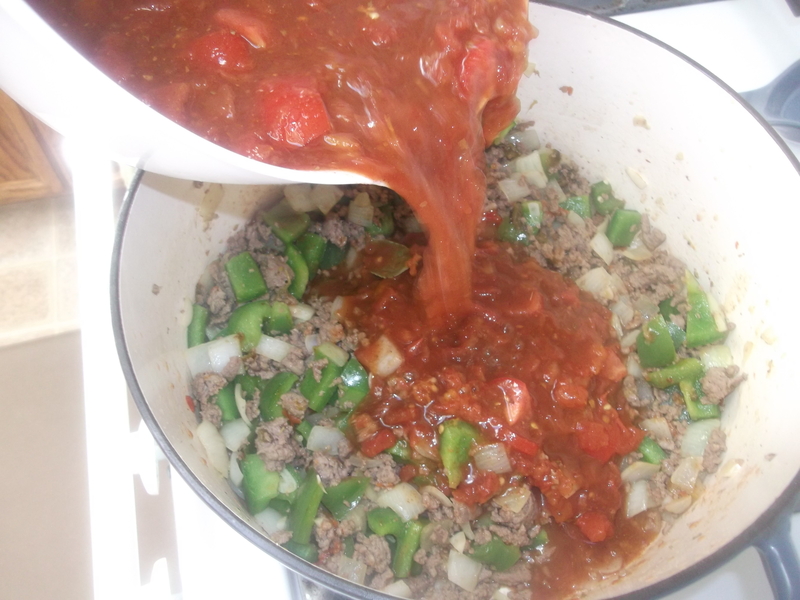 Mix together the remaining ingredients (except for the canned beans) in a separate bowl, then add to the beef mixture. Cover and simmer on the lowest heat setting 8-10 hours. About an hour or so before serving, rinse the beans well and drain, and add them to the chili. 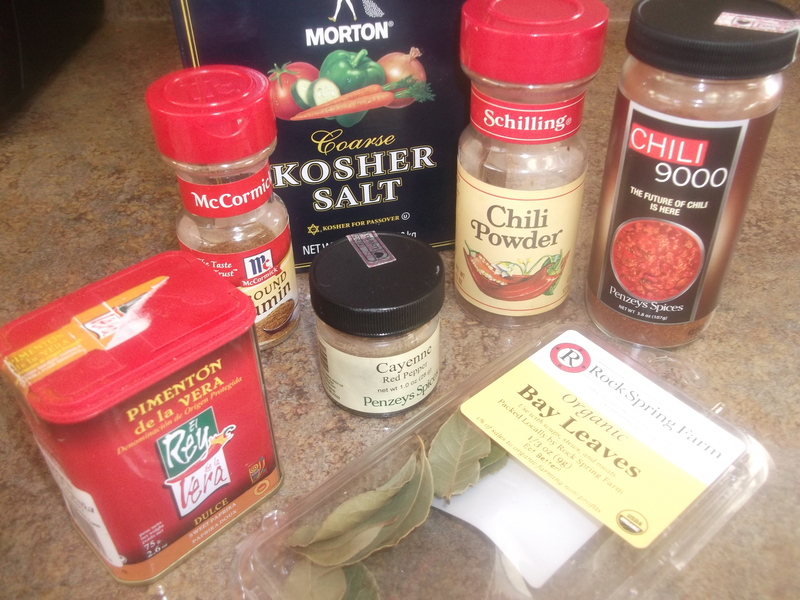 Remove bay leaves prior to serving. As always, the higher quality (and fresher) ingredients you use, the better things will taste. For taste and health reasons, I always use grass-fed beef. I use my own hot chiles, too, that I roast and then freeze, but any canned chiles will work. I especially like New Mexico Hatch green chiles. While the meat is browning, chop the things that need chopping. Size is not that important. 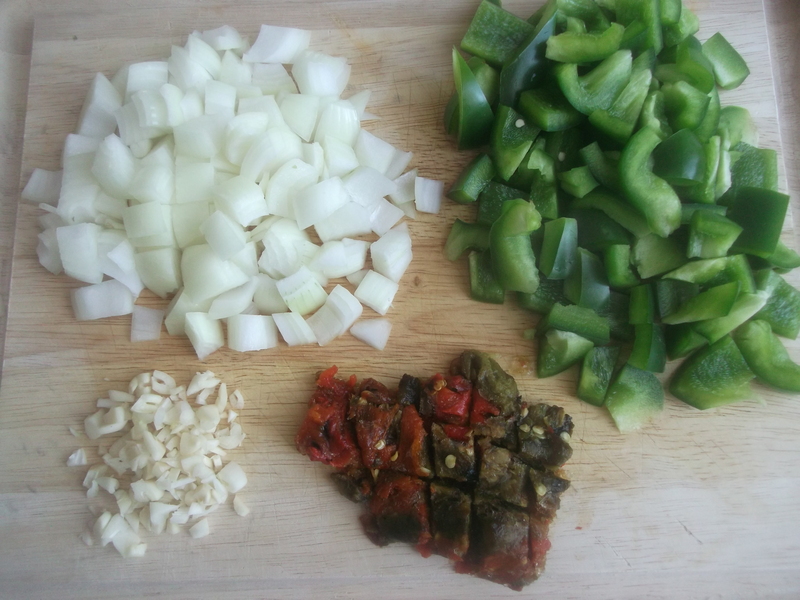 When the meat is browned, add these chopped vegetables and cook, stirring, until softened. Mix all the remaining ingredients together (except for the beans) in a separate bowl and add to the beef mixture once the vegetables are softened. 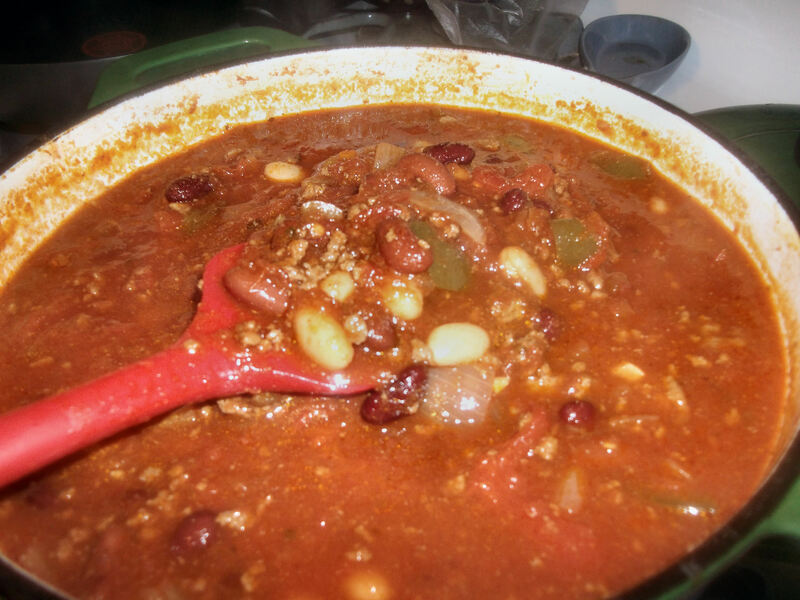 About an hour or so before serving, open the cans of beans, rinse them well and drain, then add them to the chili. Taste the chili, and if it needs more tomato sauce, add the second can. Cover and cook for another hour or so. Remove the bay leaves prior to serving. Enjoy!